Just like an island paradise offers a great deal of R&R, a kitchen island can also contribute to making home life in the kitchen a little easier– and for the most part– more interesting and fun. Having an extra working surface in the middle of your kitchen not only makes meal prep and cooking more efficient, but alters the way you use and enjoy the most frequented room in your house. 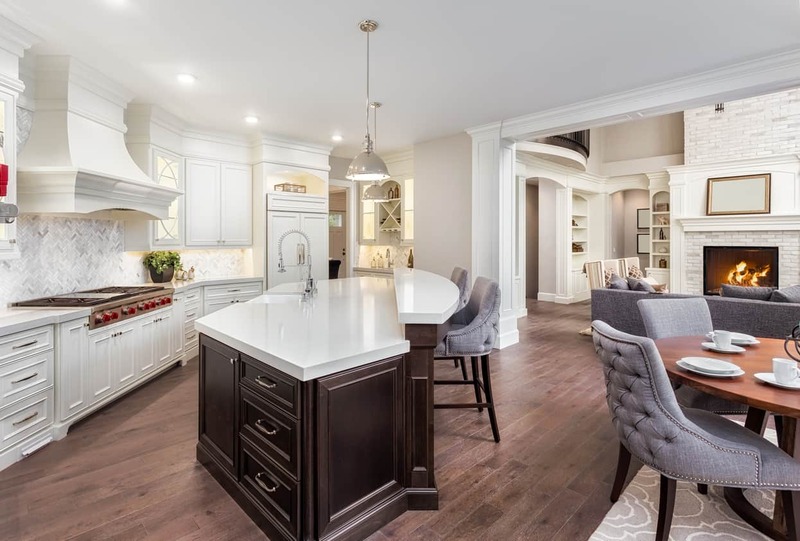 Home remodeling that incorporates a kitchen island is beneficial for many reasons, but the most significant would be having a main hub for food preparation, cooking, and entertaining. No matter what your core purpose is for installing a kitchen island, your Las Vegas Contractor will confirm the most important thing to remember when in the design phase is functionality. The functionality of your kitchen island is paramount for you to accomplish all tasks in the kitchen with ease, as it becomes the pivot point between your kitchen’s food-prep, cooking and cleaning zones. Having a prep sink with a garbage disposal is extremely handy. Make sure there is effortless access to your silverware/utensil drawers, cabinets, dishwasher, garbage and trash compactor. Opting for self-closing drawers is a great option for families that tend to leave drawers open. Your island cabinets should offer space for oversized kitchen items, such as food processor or blender, and have an area below the sink for dish soap, towels etc. There should be plenty of clearance for your dishwasher and trash compactor doors to open for proper traffic and workflow. Your kitchen island should have electrical outlets in strategic areas for cooking appliances. If your kitchen island faces out to your living or family room, having dual height counters to hide dirty dishes from view is recommended. With the option of having a kitchen island to include additional drawer space, shelving, and cabinets, the island becomes not only an extension to your kitchen space–but a co-pilot for every cooking and prep task. Having the additional space allows for you to expand your cooking creativity. Designing a working side and public side to your kitchen island is recommended for the optimum benefits that a kitchen island contributes to the overall use of the kitchen. Having a prep sink and garbage disposal in the middle of your kitchen is extremely helpful for preparing meals more efficiently. Prep sinks make islands ideal for not only rinsing/cleaning food but washing hands and bartender prep for parties. Whether your kitchen island surface is stone, granite, quartz, butcher block or other, tucking your sink into the corner of an island allows for maximizing your working surface. A kitchen island can be used as an informal dining area, as well as additional seating while entertaining. Having the ability to cook and prepare meals while still being part of the festivities is both convenient and enjoyable. Whether your space seats a larger group of 6 or only 2, it’s always a bonus to be able to have more seating space in your kitchen. Whatever design shape for your island that you choose, having both cooking and eating on the same island should have a two-tiered design with counter height for eating area raised to avoid cooking splatters. Your lifestyle will determine how you plan to use your island and whether you will choose to have it be mostly for storage, a prep & wash station, eating area, cooking and eating combined, or more for entertaining. Choosing your kitchen island shape depends on the square footage of your kitchen, as well as thinking about how you will be using it the most. There can be endless custom kitchen island shapes, but some of the more common are Rectangular, L-Shape, T-Shape, U-Shape, & Dual islands. All these shapes can incorporate designs for prepping, cooking, eating and entertaining. Mobile kitchen islands can offer the best of both worlds– accommodating both for extra counter space and floor space. There can’t be too many cooks in the kitchen with a mobile island. Imagine everyone prepping in different areas of the kitchen and using the island for a wine and appetizer hub. Or perhaps the island could be useful as prep or display for desert, and rolled away to the dining room once dinner has finished. Mobile islands can be rolled to any part of the kitchen for extra working surface to streamline meal preparation. A kitchen island with seating space is a great place for kids to eat and hang out. Whether they are having after school snacks while doing their homework or having a meal, this is an ideal spot for family time conversation. Kitchen islands can make cooking and clean-up duties easier and more fun for kids while using the island’s many amenities. I had cooktop and sink in an island and loved it just redone my kitchen with a u shape in the middle of my open plan room – breakfast bar on one end and cooktop and sink with downdraft extractor in the middle and love it even more. If you prefer when cooking and prepping to be chatting to family and friends instead of your back turned staring at a wall, perhaps a cooktop island is best for you. If you’re cooking alone, you can have more to look at—out the windows or tv—rather than the wall. If you decide to have a cooktop in your island, it is best to have a prep sink with garbage disposal on your island as well as proper ventilation with hood or downdraft. As mentioned earlier, your lifestyle will dictate what design of kitchen island is best for you—as well as what added fixtures and appliances you will choose. For instance, if you entertain frequently, you might find installing a mini refrigerator or wine fridge would suit your needs. If your passion is cooking from recipe books, you may choose an island with open shelving on one end for easy access to your cookbooks. If you enjoy baking, an island with an added work surface at the correct level for kneading is a handy choice, along with enclosed shelving to keep your cookbooks safe from being coated with flour. If you have younger kids who want to make their own snacks, installing a microwave in your kitchen island is helpful. Our pets know that the kitchen is where the goods are and if you’re in the kitchen, chances are they are right behind you. The kitchen is the most natural place for your pets to eat, but often there isn’t an ideal spot for their dishes that doesn’t end up getting in the way. If you have an existing kitchen island or installing a new one, you might consider having a built-in pet feeding station to keep everything tidy and out of the way of traffic flow. The pet station can include drawers above to store treats, medications, leashes, doggie bags, laser lights, toys and anything pet related that you want to keep all in one place for an easy find. Whether you have a large room that allows for a kitchen island that contains all the above listed amenities or a small room with a mobile roll-away kitchen island, the benefits of having this extra working space far outweigh not having one. It streamlines prep and cooking—allowing for more space and storage, as well as allowing family and friends more time to enjoy being together for every meal.